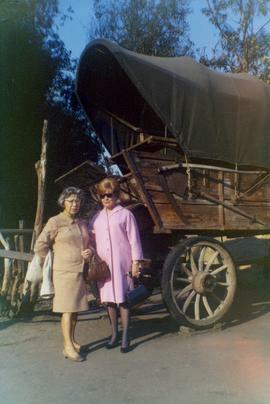 Photograph depicts Ann and an unidentified woman standing in front of a wagon. Colour Kodachrome 35mm slide depicts automobile in a glassed in building with an array of signs. Photograph depicts an automobile parked near a camp station. B.C. Electric Office Building, New Westminster, B.C. 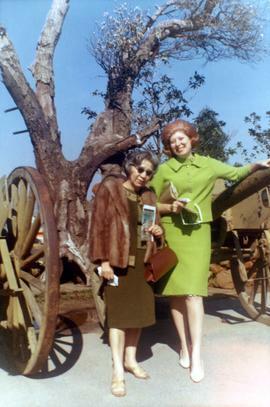 Photograph depicts the B.C. Electric Office building in New Westminster.Truck parked in front of one storey concrete building; truck labeled "MERCHANTS", "CARTAGE". B.C. Electric Plant, Ruskin, B.C. Photograph depicts construction on Ruskin Dam.Blurred locomotive passing through middle of image on raised railway tracks; two storey steel frame structure in middle of image, connected to bridge; outbuildings on top of hill in background.